One of my favorite parts about writing a book is creating the characters. However, I've often found that it can be very easy to play favorites--meaning, you spend a lot of time learning all about one or two of your characters, and accidentally leave the other characters kind of . . . under-developed. I definitely play favorites. My two favorite characters in my book were Avalon (my main character) and her brother Ashton. I loved developing them because their stories and personalities were so interesting. On top of that, they were siblings and it was fun to play around with their dialogue. But when it came to my other characters, they were flat and a few were super cliche. A lot of writers have this struggle. Some characters we love, and other frustrate us to no end. So how do we fix this? 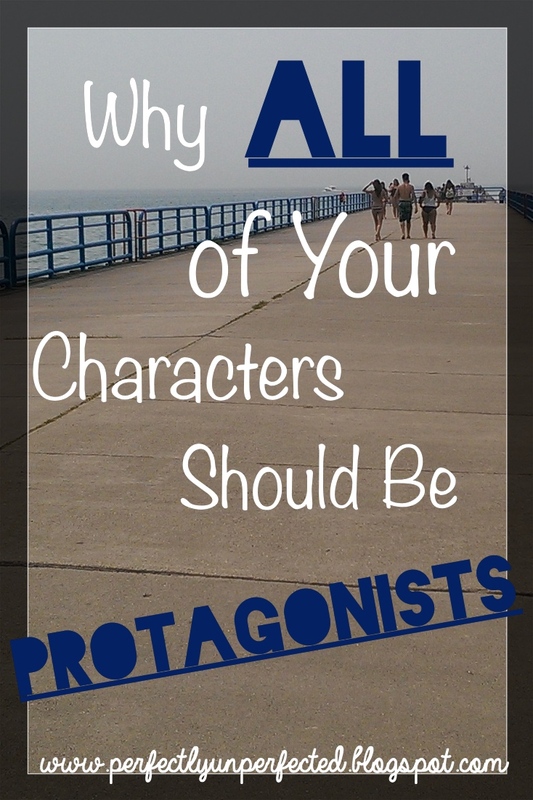 Simple: make all of your characters protagonists. And no, I don't mean give each and every one of your characters a personalized quest and a POV. I mean treat all of your characters like they have their own story, because they do--even if you aren't telling all of it. 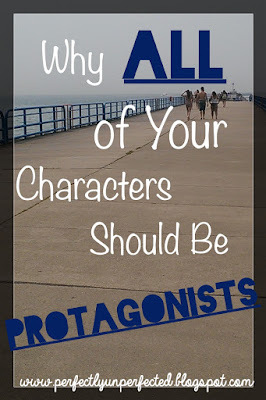 Treat every single one of your characters like they are the protagonist of their own story. 1. What conflicting desires does this character have? A conflicting desire means your character wants something, but also wants something that completely conflicts with the other thing. For example, my other main character, Tripp, wants to run away and live the life he's always dreamed with his girlfriend, Avalon. However, he also has an overwhelming desire for Avalon to be truly happy. These desires are conflicting because in order for Avalon to be truly happy, Tripp might have to step out of the picture, therefore destroying any chance of him running away with her. A conflicting desire is important in your characters because it gives them individual wants as well as problems. 2. What contradicting traits does your character have? Similar to a conflicting desire, a contradicting trait is a part of your character's personality that conflicts with another part of their personality. For example, a character who loves talking to people and making friends, but is very shy or crippled by social anxiety. In my book, Avalon is adventurous and loves to try new things, but is conditioned to stay in line and follow orders and be the same as everyone else. Contradicting traits are good internal problems that add a lot of interesting situations and thought processes to the story. 3. What are your character's vulnerabilities? No character is perfect. In fact, it's a character's imperfections that make them memorable and lovable. So what makes your character weak? For my character Ashton, he holds himself accountable for things out of his control, and all of that guilt eats him alive. Avalon is claustrophobic and can't handle any kind of tight space. And Tripp makes bad choices with good intentions. These weak points make characters more human and also give you something to work off of, so it's good to identify them! 4. What are your character's secrets? All characters have secrets, and it's your job to know them. While you don't need to tell every single secret, it's good to let them out slowly throughout the book. Secrets make things interesting; they can induce tension, sadness, anger, and other emotions. Figure out what secrets your characters are keeping! It might just tell you something brand new about them. So there you have it! Four questions to get further into your character's heads and make them the protagonists of their own stories. Hopefully this will help all of you struggling with developing those pesky minor characters, or maybe even your main characters! Haha, I definitely have the same problem. Sometimes I don't even notice until I start writing and realize that one (or more) of my characters are cardboard sticks. Or they make their own personality that contradicts the purpose of the story and derails everything. So yeah. Definitely worth thinking about. Literally every time I see a post in this blog it has been something that I'm struggling with... right now a character is severely underdeveloped and I'm having a tough time with her. Thank you so much for this post! !